The Acadia gets a complete redesign for 2017. The first-generation GMC Acadia was one of the brand’s most popular SUVs, so where does a carmaker go from there? GMC decided to improve one of the areas where the previous Acadia wasn’t so strong: efficiency. It used the opportunity of a full redesign to cut weight and added a four-cylinder engine for buyers who want better fuel economy, but still retained the Acadia’s high level of functionality. 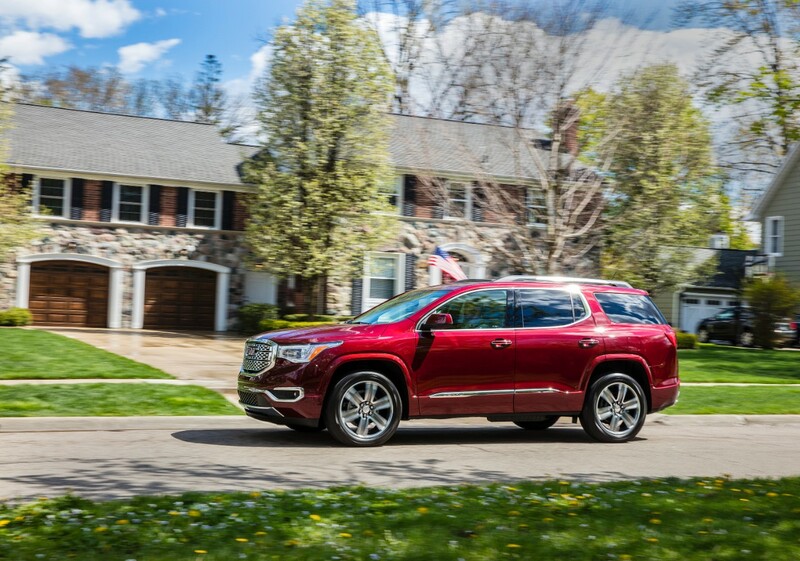 A major focus of the GMC Acadia’s 2017 redesign was improving efficiency without sacrificing performance and capability. The Acadia is leaner and meaner than ever before. One of the biggest changes for 2017 is the addition of a new 2.5-liter four-cylinder engine to the powertrain lineup. This engine produces 194 horsepower and 190 pound-feet of torque. For those desiring more power, GMC still offers a 3.6-liter V6 with 310 hp and 271 lb-ft. Unlike many supposedly “all new” redesigns, the Acadia truly is brand new from the ground up. It rides on a completely new platform, and GMC took the opportunity of this ground-up redesign to cut some weight from the SUV. Extensive use of high-strength steel and other design changes removed around 700 pounds, GMC says. Standard equipment on the base SLE-1 model includes 17-inch aluminum wheels, tri-zone automatic climate control, OnStar® 4G LTE with built-in WiFi hotspot, LED daytime running lights, heated outside mirrors, leather-wrapped multifunction steering wheel, and more. The SLE-2 model adds a power liftgate, fog lights, 18-inch wheels, remote start, heated front seats, a power driver’s seat, and IntelliLink® system with 7.0-inch central touchscreen. The SLT-1 model builds on the two SLE models, adding a Driver Information Center, 8.0-inch central touchscreen, Bose® eight-speaker premium audio system, auto-dimming rearview mirror, power tailgate, power front passenger seat, and front lumbar adjustment. The SLT-2 model includes those features as well as Intellibeam headlights, 20-inch wheels, memory package for the driver’s seat and exterior mirrors, and other features. As with virtually all GMC vehicles, the top model is the Denali. This trim level brings its own special design elements, as well as a greater level of standard equipment including navigation and other items. The engineering of the 2017 GMC Acadia may be all about shedding weight and improving efficiency, but the styling is still old-school and truck-like. In fact, the new Acadia looks even more like a traditional SUV than the previous generation. The front end is more upright, although headlights that wrap around the front fascia still give the Acadia a relatively sleek look. The wheel wells are boxed and flared, making the Acadia look bigger and tougher than its car-like unibody construction might imply. At the back, the D-pillars were blacked out to create the appearance of a wraparound window. On the inside, each Acadia trim level gets its own color scheme and trim combinations. 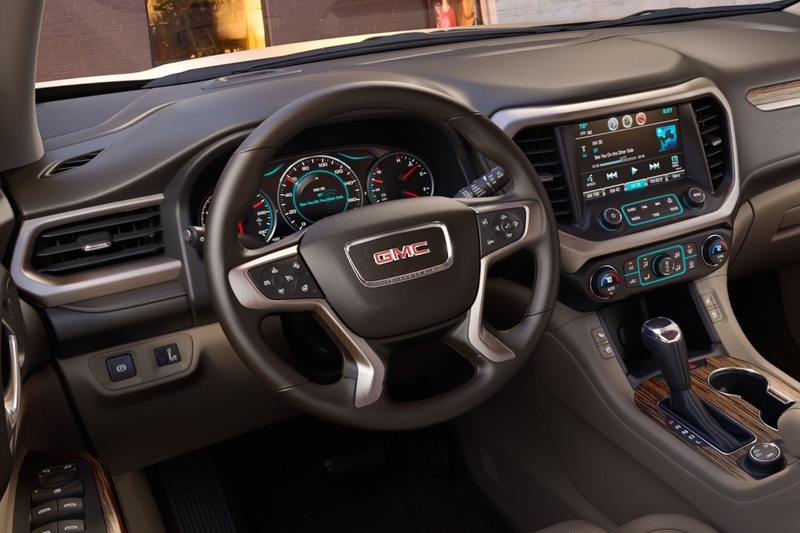 GMC has made a point of using real aluminum and other materials in place of plastic on its higher-level models, giving them a more upscale feel. Regarding technology, the Acadia gets GM’s OnStar® 4G LTE system, which includes a built-in Wi-Fi hotspot that can support up to seven devices. The Acadia has functionality covered as well. A split folding second-row seat can also slide forward for easier third-row access, while the 50/50-split fold third row itself folds completely flat. With both the second and third rows folded, the Acadia offers 79 cubic feet of cargo space. The Acadia also features a rear seat alert to remind drivers when an item may have been left in the second- or third-row seats. 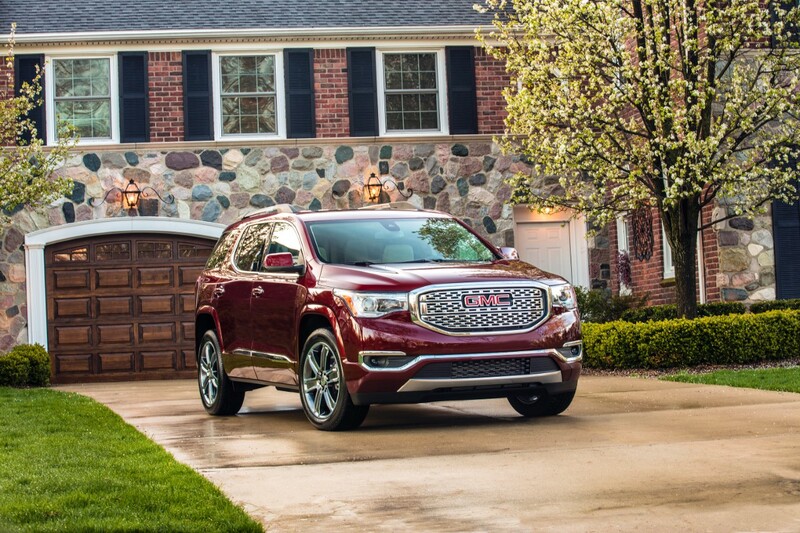 Standard safety equipment on the 2017 GMC Acadia Denali includes anti-lock brakes, stability and traction controls, a rearview camera, and a full array of airbags. Optional equipment includes Following Distance Indicator, forward collision alert, front and rear parking sensors, lane keep assist, Front Pedestrian Braking, rear cross traffic alert, Lane Change Alert, and a Tow Vision Trailering system that adds dynamic gridlines to the rearview camera feed in order to make hitching up to a trailer easier. 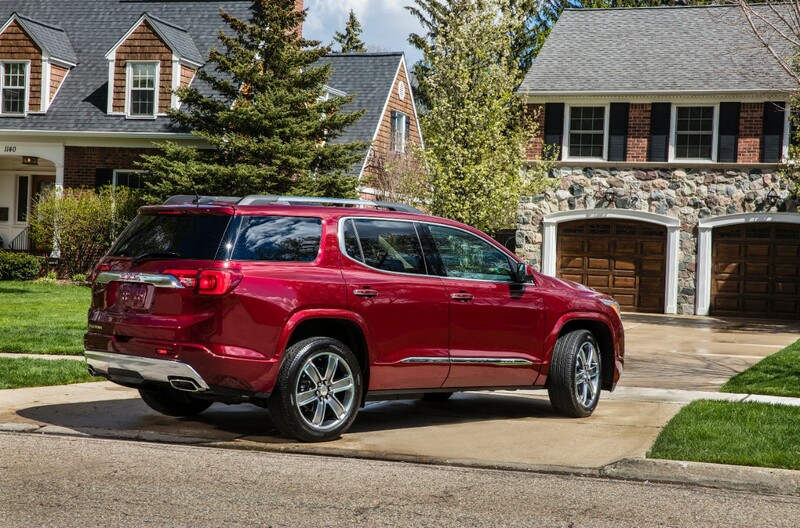 The 2017 GMC Acadia is a more efficient take on the family-hauling SUV. Be sure to contact us online or visit Rivertown Buick GMC at 1661 Whittlesey Rd, Columbus, GA 31904 to schedule a test drive. *EPA estimates. Your mileage will vary depending on driving habits and conditions.